I was employed as Manager Monitoring & Evaluation. Together with our Max Foundation colleagues and Bangladeshi partner organizations, I worked on developing innovative tools and methods for project monitoring. Our aim was to move from traditional output monitoring (for example: number of latrines built) to innovative results monitoring (for example: reduction of water borne diseases). This was a challenging, interesting and exciting task. Our overall objective was to reduce child mortality through an integrated WASH (Water, Sanitation and Hygiene) approach. Max-WASH inter alia includes promotion of hygienic sanitation, safe water options, hand washing, healthy diets and sexual and reproductive health rights. Education: BSc in Forest and Nature Conservation. @Wageningen University in the Netherlands. Graduation year: 2011. Certificate (Postgraduate, 30 ECTS) in International Development Practice. @Harper Adams University in the United Kingdom. Graduation year: 2014. “The best way to find yourself is to put yourself at the service of others”, Mahatma Ghandi. That is what I did before YEP. 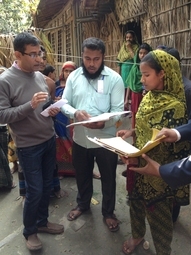 I worked with VSO, local farmers and rural communities on solutions for water scarcity in Bangladesh. We inter alia built community-based rainwater harvesting plants, replaced water-intensive rice cultivation by fruit nursery and replaced Eucalyptus trees by more water efficient local tree species. Last year I probably learned more than in the previous 28 years of my life. After one year I was far from ready to leave Bangladesh. I am thankful to YEP and Max Foundation for giving me the chance to continue contributing to both the development of Bangladesh as well as to my own development. Before coming to Bangladesh I used to be a politician for the Dutch Green Party (GroenLinks). I inter alia worked as a policy advisor in the European and Dutch Parliament and had the honor to serve as a Member of Parliament in the Netherlands. As a policy maker I worked on different issues, including legislation on water, agriculture and environment. In 2012 I decided to change my path of life after more than a decade of politics.